Crowd of people crossing Meiji dori street at Shibuya station busy intersection lit with colorful signs and ads in the evening rush hour. Shibuya, Tokyo, Japan. 2014. Artistic motion blur. Rights-Managed photo of Crowd of people crossing Meiji dori street at Shibuya station busy intersection lit with colorful signs and ads in the evening rush hour. Shibuya, Tokyo, Japan. 2014. Artistic motion blur. This image is available for licensing for a variety of editorial and commercial uses in publications, designs, web and social media. 5888x4237 px, 71.38MB uncompressed / 7.69MB jpg. Need larger? 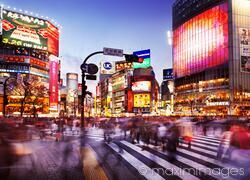 This Rights-Managed stock photo 'People on busy interesection Shibuya station street crossing Tokyo Japan' is created by Alex Maxim and can be licensed for your advertising, corporate, editorial or other use. Click 'Buy Usage Rights' to estimate the license fee and add the image to cart. Licensed files are delivered electronically as soon as the payment is processed. This photo can be used as an illustration for your web article or a blog post, for an editorial placement within a book or a magazine, and in many other different applications. Top quality art photo prints of this image can be ordered in a variety of sizes and paper finishes.